Celtic Gold is a business of two halves. 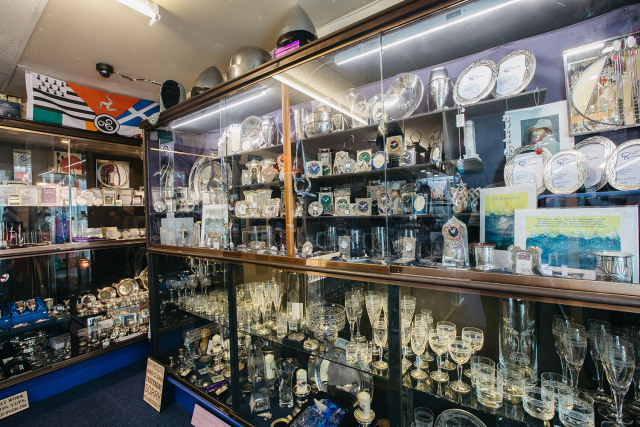 Our shop offers a well stocked and relaxing environment for you to browse at your leisure. Our staff are on hand to offer you friendly service and advice. Samples of our gift ranges and jewellery are found on our website but there is much more available in store. If you are not able to visit, please feel free to contact us by phone, email or via social media and we will try our best to assist you. Behind the scenes we have a fully equipped workshop with four jewellers creating Celtic Gold jewellery. Each piece is created using the lost wax casting process and then finished by hand. Our jewellers are on hand to advise customers on jewellery repairs, re-modelling and commission pieces, we are always happy to discuss thoughts and new ideas with customers. The majority of work is carried out in-house here on the Isle of Man. Working alongside our jewellers is our in-house jewellery valuer. We provide a full valuation service for insurance replacement and probate carried out here on the Isle of Man. If you are unsure whether any of your jewellery requires a valuation we offer to work through your jewellery with you or for you, free of charge to help you become more informed. We can also document your jewellery for you so you are protected should anything be lost or stolen. Our enthusiasm for jewellery is endless and our relaxed atmosphere provides the perfect environment to chat about jewellery.